Syria talks convened by US Secretary of State John Kerry in the Swiss city of Lausanne on Saturday evening failed to agree on a common strategy with Russia to end the conflict in Syria, now in its sixth year. Kerry was seeking a new path to peace after failing to secure a ceasefire in direct talks with Moscow, one of Syria’s key backers. Kerry hosted Russian Foreign Minister Sergei Lavrov and seven foreign ministers from the region – from Iran, Iraq, Saudi Arabia, Turkey, Qatar, Jordan and Egypt – weeks after the collapse of a painstakingly crafted US-Russian ceasefire plan that many saw as the last hope for peace this year. Kerry told reporters there was consensus on a number of options that could lead to a ceasefire, but conceded that there had been some tense moments during Saturday’s talks. But the meeting failed to come up with a joint statement or a shared vision on how to move forward, according to Reuters. Lavrov, who had said he had “no special expectations” for Saturday’s meeting, said ministers had discussed several “interesting ideas”, without elaborating. Europe was not represented at the meeting, held in a luxury hotel on Lake Geneva. But France’s Foreign Ministry confirmed that Kerry and foreign ministers of like-minded nations planned to meet in London on Sunday to discuss Syria. 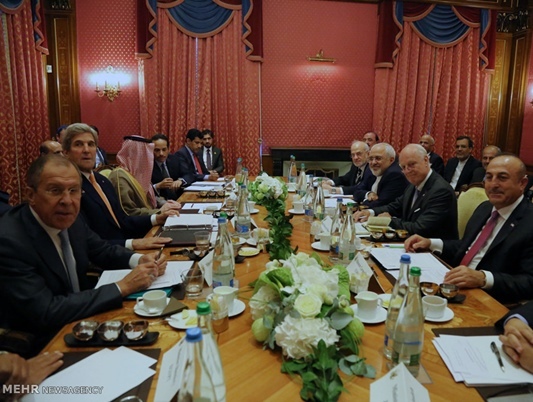 Kerry said parties to the Lausanne talks would contact each other on Monday to follow up. Since the breakdown of US-Russia cooperation, long the backbone of efforts to end the war in Syria, US officials have worked on a number of ideas. Although no breakthrough had been expected on Saturday, a senior US official said before the meeting that the regional format to the talks could be the basis of a new process. Earlier, Kerry met separately with his Saudi counterpart Adel al-Jubeir and with Lavrov to discuss the logistics of the meeting. It was the first meeting between Kerry and Lavrov since the collapse of a second attempted ceasefire in September. The impending end of the Obama administration is likely to mean a hiatus in US diplomacy while his successor, whether Donald Trump or Hillary Clinton, takes up the reins.